What interactions exist between the composition of the microbiome in the digestive tract and its diseases, such as inflammatory bowel disease or colon cancer? The new Collaborative Research Center "Microbiome Signatures – Functional Relevance of the Microbiome in the Digestive Tract", which is funded by the German Research Foundation, deals with this question in both basic and clinical projects. 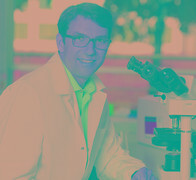 Prof. Dirk Haller, Professor of Nutrition and Immunology at the Technical University of Munich (TUM) and head of the "ZIEL - Institute for Food & Health" at the TUM Weihenstephan campus. The German Research Foundation's Collaborative Research Centers are among the most important research support programs in Germany. They facilitate demanding, interdisciplinary and long-term research projects. The German Research Foundation approves the SFBs for an initial period of four years, with a maximum total support duration of twelve years. In total, the Committee approved ten new Collaborative Research Centers at its autumn session.